Texas A&M University System regents voted Wednesday to extend the contract of Chancellor John Sharp through 2023. 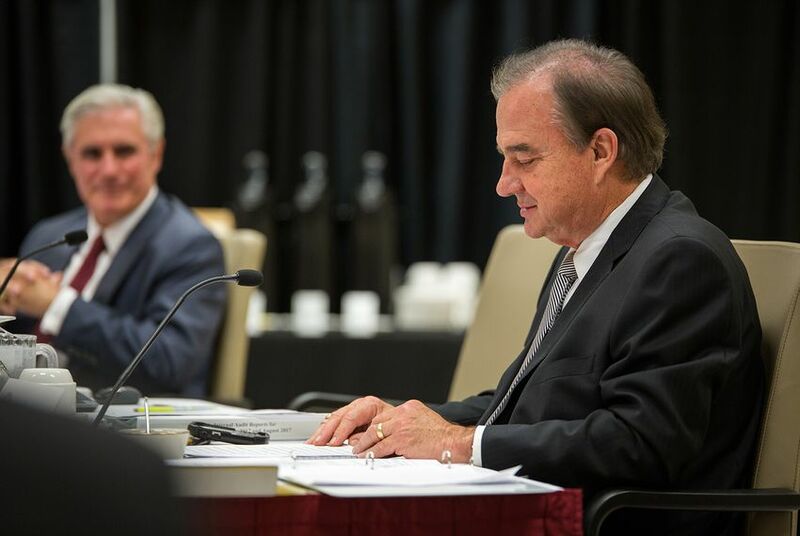 In a move they declared a vote of confidence in system leadership, the Texas A&M University System Board of Regents paved the way Wednesday for a three-year contract extension for Chancellor John Sharp. The move, once finalized, would extend the folksy, hard-charging chancellor's contract to 2023. If he remains on the job until the end of the deal, he'll have served for 12 years. Regents approved the decision by a unanimous vote, although that was perhaps because two of Sharp's critics on the board were absent from Wednesday's meeting. One of those, Regent Tony Buzbee, opposed the idea of an extension earlier this year, saying there was no compelling reason to approve one with three years left on Sharp's contract. Regents originally planned to approve the extension this spring but delayed the move in part over criticism that it was being considered before new Regent Tim Leach had been confirmed by the Texas Senate. Leach voted in favor of the extension Wednesday. Sharp has had a transformational, if sometimes controversial, impact on the College Station flagship during his time as chancellor. Under his watch, A&M joined the Southeastern Conference for athletics, completed a major renovation of its football stadium, began working to double enrollment in its engineering school and announced plans to open a satellite teaching campus in McAllen. "From day one he has been a bold, innovative, visionary leader and he has really made a difference for the A&M System," said Regent Phil Adams. The extension isn't yet official. Wednesday's action simply authorized the board's chairman, Charles Schwartz, to negotiate and finalize the deal. But the deal has already been agreed to in principle. Sharp's salary will remain unchanged at $900,000. With other benefits, his total pay this year is expected to be $1.3 million, according to a report filed with the Legislative Budget Board. Sharp received a standing ovation after the motion was approved. He thanked regents and said most of the credit for his work goes to his "incredible staff." "I hope I live long enough to fulfill your contract," he said. Disclosure: The Texas A&M University System, Texas A&M University and Tony Buzbee have been financial supporters of The Texas Tribune. A complete list of Tribune donors and sponsors can be viewed here.